If someone demanded you give them something of yours or else they’d put you in a cage, you’d probably be pretty upset. Taxes. Everyone hates taxes. Why does everyone hate taxes? Because taxes are someone else taking something you’ve worked hard for. Someone else isn’t asking, and you aren’t freely giving. Instead, someone else is taking from you without your permission. Everyone hates taxes and the first century Jewish people were no different. In the Gospel accounts Jesus is challenged on whether or not taxes are lawful. Jesus replies by saying “render unto Caesar what is Caesars.” What is the extent of what is owed to Caesar? What do we render unto human government? Our money? Our loyalty? Our allegiance? Our service? Our lives? Christ’s answer may surprise you. The Jewish people were a nation without sovereignty. Not only were they a conquered people, they were oppressed and heavily taxed. Often taxes were collected by fellow Jews who most viewed as traitors (Matthew 5:44-46, 9:10-11). Because of this, taxes were a hot topic in Jesus’ day. The religious leaders were trying to trap Jesus. Many of them wanted him dead or out of the picture. If Jesus said the tax was illegitimate, then he would be liable for immediate arrest by the Romans. If he said the tax was legitimate, it would discredit him as the Messiah because Caesar’s money was in violation of God’s first and second commandments of the Mosaic Law (Exodus 20:3-4). One way the Romans integrated into the lands they conquered was to circulate their own money throughout the empire. This became the basic coinage against which all others were measured. When asked whose image was on the coin, the Herodians replied to Jesus: “Caesar’s.” In the Roman world, an individual mark on an object denoted ownership like cattle brands in the American West, in the 19th century. The mark was the only way in which ownership could be recognized. In the Roman empire it applied to all goods. People all had their own marks, whether a seal, stamp, or painted sign. 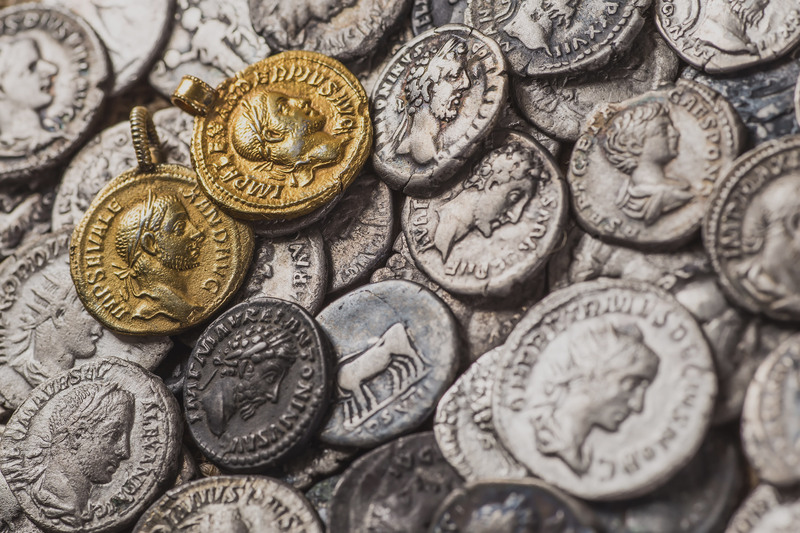 All Roman coins belonged to Caesar. The head of Caesar on this coin was more than a decoration or a mark of honor, like heads of presidents are on U.S. currency. It signified that all Roman coins in circulation belonged to Caesar. This was very important. Those who held the coins were very precarious owners. They never really owned the bronze or silver pieces. Whenever an emperor died, the likeness was changed on every coin. Caesar was the sole proprietor. The first part to Jesus’ answer is very simple: “Render unto Caesar that which is Caesar’s.” You find his likeness on the coin, and therefore the coin belongs to him. It means that Caesar, having created the money, is its master. Give it back to him when he demands it. That’s all. With this answer, Jesus does not say that taxes are lawful. He does not counsel obedience to the Romans. He simply faces up to the evidence. But what really belongs to Caesar? The excellent example used by Jesus makes this plain: whatever bears his image. Here is the basis and limit of his power. Where is this image? On coins, on public monuments, and on certain altars. That is all. Render to Caesar. You can pay the tax. With his reply to the Pharisees and Herodians, Jesus is not legitimizing taxes. Jesus is simply saying that Caesar created the money. Jesus declares that money is under the dominion of Caesar, a human leader who gets his power from Satan (John 12:31, 14:30, 16:11; Ephesians 2:2; 2 Corinthians 4:4; 1 John 5:19; Luke 4:5-6). On the other hand, whatever does not bear Caesar’s image does not belong to him. It all belongs to God. Caesar has no right whatsoever to the rest, and the rest includes a lot of things. The second part to Jesus’ answer was: “…give to God what belongs to God.” Roman coins bore the image of Caesar, and thus belonged to Caesar. Think of what bears the image of God: people do (Genesis 1:26). “Give back to Caesar what is Caesar’s and give to God what belongs to God.” Caesar therefore has no right to the lives of people. Human leaders have no right of life and death. Caesar has no right to plunge people into war. Governments have no right to devastate and ruin other countries. Caesar’s rightful domain is very limited, according to Jesus. Nations of the world do not have a right to our allegiance. Only the Kingdom of God, Christ’s nation, deserves that. Nations of the world do not have a right to our loyalty. Only the Kingdom of God deserves that. Nations of the world do not have a right to our lives. Only God deserves that. Often people interpret Jesus’ answer according to their own worldview and subjective interpretations, but Jesus did not really even give a definitive answer to the question, “Is it lawful to pay taxes?” Instead, Jesus makes a very clear distinction between categories of ownership that many people miss: money that a government creates belongs to that government, and everything else belongs to God (Psalm 24:1). A mistake many people make regarding this and similar Biblical passages, is that people tend to interpret the meaning through the worldview they were raised in rather than Christ’s worldview. Nowhere does the Bible reveal God initiating a human political system where humans rule other humans (1 Samuel 8:6-7). The Bible reveals God to be against human governments. Governments are illegitimate before the eyes of God and thus, any nationalistic interpretation is flawed and incorrect. Because of many people’s upbringing, even today, many people read Jesus’ answer and tend to read the words as a declaration that people owe taxes and that their nation deserves their allegiance and service. They interpret the answer in that manner because that is the subjective foundation from which they choose to inspect the words. Everyone hears only what they want to hear. Those who have patriotism for the pagan nation they live in will interpret Christ’s words to mean that the state is owed allegiance, loyalty, service, and our lives. Those who have patriotism for the Kingdom of God will interpret Christ’s words to mean that the state is owed nothing except the money it created. Everything else belongs to God: our allegiance, our loyalty, our service, and our lives. This dual interpretation is exactly what happened in the Gospel account. Neither the Pharisees nor the Romans could accuse Jesus of treason. The Jews would have heard Jesus’ answer as meaning everything belongs to God, and Caesar had a false claim to rule. Romans standing nearby would have heard Jesus utter his answer, “give to Caesar…” Those Romans probably chuckled and said, “Now, there is a Jew who knows his place with Caesar!” Yet, those same Romans heard the same words as everybody else and interpreted them according to their own philosophical worldview. This passage has been used to develop the notion of a division of realms between the physical and the spiritual, whereby the state should be concerned with the material (politics on how the world should be run), and the church, with the spiritual (immaterial and religious matters). But the truth is, Jesus is neither siding with the establishment, nor dividing realms between politics and religion. In the worldview of Jesus, there is the false and demonic ruler-ship of nations of the world, and there is the true Kingship of Jesus and his own unique politics. No one can serve to masters. Either you will hate the one and love the other, or you will be devoted to the one and despise the other. The popular interpretation is that there are certain things Christians are supposed to give to the state and other certain things to God. But a careful interpretation of Jesus’ words actually seems to be telling his followers to do the exactly the opposite. Jesus believed it was his right to rule the entire realm of the physical and the spiritual; human government had no right to either. The domain of Christ’s lordship is the entire Earth, and all other rulers work for Satan. Render unto Caesar what is Caesar’s (nothing), and render unto God what is God’s (everything).